This picture goes back to end of April 1980 in Iran where PMOI members and supporters held a protest against Khomeini. PMOI members and sympathizers were the subject of daily harassment, arrests, torture and killing. The aim was to silence them and force them to surrender. Fatemeh Rahimi and Somayeh Noghreh Khaja (whose pictures are on the banners), two young female sympathizers, were killed because of their support for the PMOI. They were brutally beaten to death by Khomeini’s forces. The killing of these two young girls was a shock to everyone in Iran. Three days after this brutal killing, more than 200,000 people, mainly women, staged a demonstration in Tehran. This demonstration was not pre-planned which caught the regime by surprise. This demonstration was called the “demonstration of mothers” as mothers came to the streets to protest the attacks against vanguard girls and women by the regime’s pasdarans (revolutionary forces). 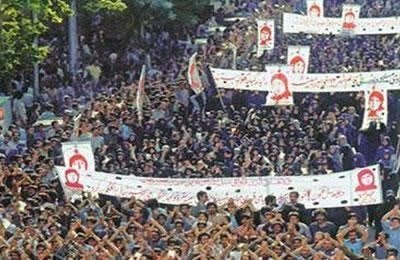 In this picture, the mothers are in the middle of the crowd protected by male supporters so that Khomeini’s thugs wouldn’t be able to disrupt or harm the protesters.